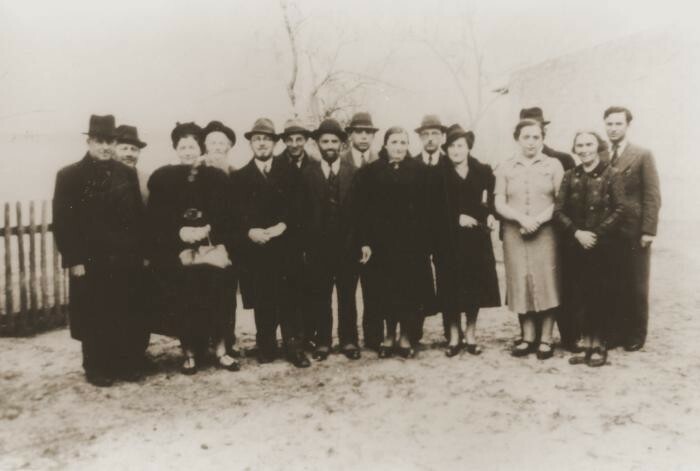 November 1938 group portrait of Jews of Polish nationality who were expelled from Nuremberg, Germany, to the Polish border town of Zbaszyn. The Jewish refugees were stranded on the border and were denied admission into Poland after their explusion from Germany. Pictured from left to right are: Leo Fallmann; Rosa Fallmann; Mr. Auerbach; Mr. Zahn; unknown; unknown; Chaim Kupfermann; Anni Kupfermann; Simon Wassermann; unknown; Regina Holzer; and Bertha Holzer.